Did you ever dream of watching your favorite Netflix shows on a pair of contact lenses? Well, if so, today's your lucky day. The entertainment giant's CEO has just announced that he would be willing to consider working on streaming content directly to smart contacts in the near future. The company's CEO, Reed Hastings, discussed his willingness to explore this new technology at the 2017 Mobile World Congress (MWC). Hastings said he sees great potential in the smart contact lens space. He believes Netflix will be the first to adapt to the changes digitally enhanced contacts bring to the media market. Although no company has been able to design a contact lens solely for the purpose of entertainment, many tech giants are working on ways to make smart contacts that are able to take pictures, record videos, and even monitor certain health issues. 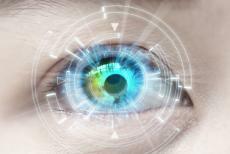 Google, for example, has been working on smart contacts that can detect blood glucose levels for diabetics. The Japanese-based company Sony is also reportedly working on contact lenses able to both take pictures and videos just by analyzing a wearer's blink. While this all sounds like something out of the world of sci-fi, smart contacts are very real and are set to revolutionize numerous industries quite soon. Netflix sees this next-gen contact lens technology as something that will inevitably change how entertainment companies do business. Hastings frequently referred to the Netflix sci-fi show "Black Mirror" in his comments on the future of smart contacts. Charlie Brooker, the British filmmaker behind "Black Mirror," actually produced one show that imagined a world where people had contacts that allowed them to access limitless information. Interestingly, it might not be long before Netflix subscribers can watch "Black Mirror" on their own smart contacts. Fans of "Black Mirror" saw Hastings' remarks as both ominous and ironic. For those with no knowledge of "Black Mirror," the series analyzes how humanity's great achievements in technology are often used for perverse purposes. Many have likened "Black Mirror" to a kind of "Twilight Zone" for our times. Since the tech world is advancing so quickly nowadays, Hastings says Netflix adopts a strategy of adaptation. This strategy gives Netflix the flexibility it needs to grow organically with the innovations in the high-tech industry. There's no word yet on whether or not Netflix is developing its own contact lenses or if it will work with another company to achieve this goal. The only big news to come out of the MWC 2017 conference on this issue is the fact that Netflix is interested in exploring this new technology. The MWC is considered one of the biggest mobile phone shows in the world. This year's gathering was held in Barcelona, Spain, from February 27th to March 2nd.